Before we brought Coco home, both my husband and I did some reading about her possible breeds. We also had a session with a SPCA counselor. It was so helpful for us, specially for our two children. We learned that we should not expect Coco to 'magically' fit in our family, nor that children would love her right from the beginning. Even though Coco is a clever girl, and it only took her less than three days to be both house trained and crate trained, there were times, Coco did have some accidents, and we must be patient with her about it. Besides Coco's high intelligence, her polar characteristics between inside home or outdoor activity are just perfect for us. I have to say, it is such an entertainment to watch Coco run whenever we take her to dog parks. Her agility and speed are an art form. I know I can definitely watch her run for a whole day if she can last. Here is a photo of my son (soon-to-be 3 yrs. old) patting Coco. The girl felt asleep just as soon as he did that! 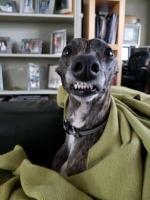 Whippet Mix Story: Here is Coco! We adopted Coco through a local SPCA since last November. According to the website, she was a smooth Collie mix. My daughter, Mia, fell in love with Coco just as soon as she saw Coco's photo. The reason we thought Coco might be also a Whippet mix is the way she moves around at dog parks. People have been commenting how fast and agile she is. 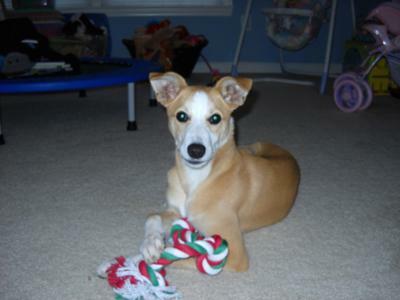 Overall, Coco is a very smart, affectionate, and playful 5 months old puppy. She makes our two young children very, very happy!